Turn sprinkler water valve off (usually in basement or crawl space). Turn both blue valves to 45 degrees. Loosen outside cap by hand (be careful not to lose cap or seal). Turn both blue valves off, perpendicular to pipe. Turn both testcocks screws to vertical position, perpendicular to the ground. Tighten outside cap by hand. Tight inside cap by hand. Turn on bottom blue valve slowly perpendicular to ground. Turn on top blue valve slowly parallel to ground. 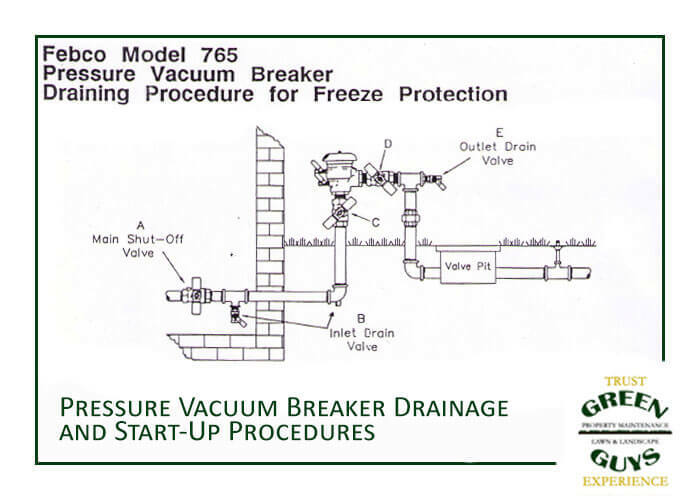 Click to download this vacuum breaker draining procedure information, along with information about the Febco Model 765, as a PDF.